VOGUE – Kate. Lives. Loves. Learns. Being South African and growing up with a certain array of magazines we become used to what we read and how our editor’s lay out certain things in our regular reads. Whether it be Cosmopolitan or Maria Claire or Elle, as soon as a new editor appears, you can smell the difference in the magazine a mile away, be it good or bad. Now living abroad away from my tried and trusted paper magazines, I buy all my monthly women’s interest magazine’s online. 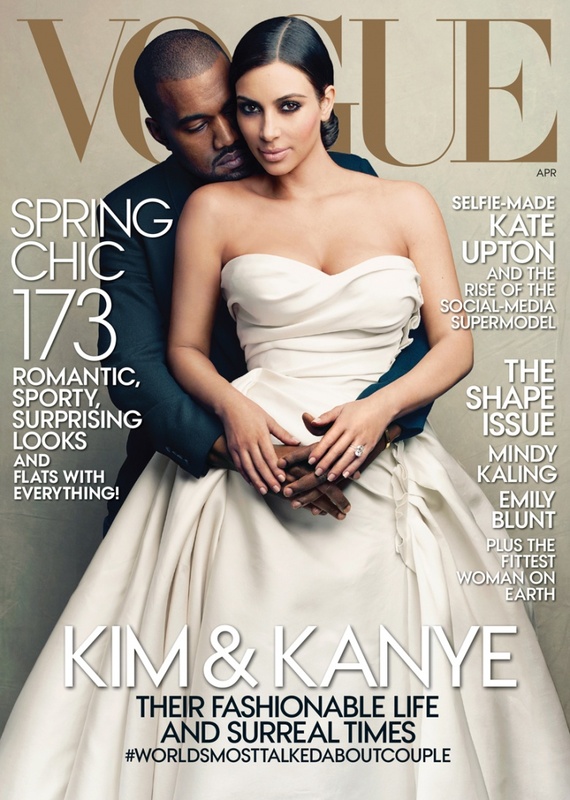 After stumbling all the buzz around the Kimye Vogue April 2014 cover issue, it got me super curious on seeing the issue for myself. Everyone was talking about it and after hearing Naomi’s comments of the cover, I was sold. Being from South Africa, I had never bought or even paged through a Vogue issue, however I had loads of perceptions about this high profile holy grail of fashion magazine title and its editor Anna Wintour… So if there was one issue I needed to buy to satisfy my curiosity it was the Kimye issue. I was expecting to open up the magazine and see a very select few top brands with gorgeous advertising spreads in the upfront positions that you spend hours drooling over. Selected spaces that for a media planner are their worst nightmare to book as brands book them 5 years in advance. I imagined Anna Wintour sitting on her throne, tearing up brand’s advertising spreads shouting “these are just not good enough for my magazine”. Reality : Vogue is Vogue, Prestigious but not Selective. From the beginning of the magazine my wrist got sore from swiping through all the advertising spreads. I couldn’t believe it, there must have been 20+ ads before I even sniffed the Contents pages, and then there were advertising spreads in between the Contents pages! I have never experienced something like that. Then to my dismay, there was an Alexander McQueen advertising spread placed upfront and straight after an H&M advertisement. Never did I expect to see an H&M advertisement in Vogue. When buying the issue digitally, I expected a great experience, interactive articles, link outs, interactive advertisements, “Behind the scenes from the cover story” etc. Anyway, my take on the holy grail of fashionista title, Vogue, I clearly have no idea on how this title is positioned and I am no fashionista BY FAR, but I expected more, think I’ll stick to my South African Elle and Marie Clarie monthlies for half the price.